It can be quite cumbersome and time-consuming for managers to handle employees leaves, process the leave information of each employee and to ensure adherence of the company leave policy. Leave applications invariably have to be handled on a daily basis and the procedure of processing them involves looking into the employee leave history, that is leaves utilized by the employee in a given period and the available leaves for future. Switching to online leave management system can be a simpler and faster way to make leave management easier for HR managers. Granting or denying leave requests can be just a click away and the process would bring in transparency and adherence to an organization’s leave policy. Precise and accurate information: With an operational online leave system, you can access accurate information about employees’ leaves and number of leaves taken by them, leave trends, and leave balances instantaneously. This makes the process a single-step procedure rather than manually flipping through the leave register pages to cull out the required information. With the online leave management system being integrated with an online payroll software, it becomes easiest to generate accurate payslips, kicking off a number of benefits in succession. Transparency: With all the information available online to employees as well as their managers, the leave system becomes all the more transparent. The employees get access to their leave history and leave balance and the manager too has access to the same. Therefore leave approval or rejection becomes more transparent. Leave policy awareness: The system can easily convey leave policy pertaining to maximum / minimum number of leave permissible, holiday calendar management according to location, number of days required before applying for planned or long leave. Employees can, at any time, refer to the leave policy before applying for vacation days. Assures compliance to leave policy: The online leave management system, customized as per the company’s leave policy can ensure compliance with the company’s leave policy as it will use the inherent rules that will not allow employees or managers to bypass rules or use favoritism while applying for or approving leaves. Visibility of employee availability: For managers, it is very important to know the availability of team members to meet the project deadlines. With online leave management, the leave trend and the leave data of employees is easily accessible to help them in approving or rejecting a leave request during crucial project delivery times without wasting time. Adherence to law: Every country has labor laws governing employee leaves. And it is crucial for the employer to adhere by the law of the land that lays down the rights of the employees pertaining to their leaves. Failing to comply with the complex legal requirements may lead to liability for the company. This can be avoided easily with the implementation of online leave system which adheres to the local applicable laws as well. Implements discipline: The online leave management is a transparent system which adheres to company leave policy and the local labor laws. The employees and the managers can use the system without any shades of gray. Providing an easy access to personal leave history and leave availability can improve accuracy and build discipline in an organization. As a result, better employee attendance can also be expected as the employees will be well aware of the consequences of not adhering to the company leave policy. The benefits enumerated above are indicative of technological advancements in workforce management, which have replaced old traditions of using registers or maintaining spreadsheets on standalone machines. These modern processes help in saving time and money in a fast paced business environment where simpler and quicker processes rule over the complicated old management systems. Benefits of Automating Time Attendance. Employees are the biggest assets when it comes to any organization aiming to realize an increase in growth and profitability. Conversely, an organization’s workforce might as well become its largest liability, which can impact its production and profitability. The solution to the problem lies in ensuring efficiency and effectiveness in performance. One of the answers to the common question lies in ensuring accountability of effort through timekeeping. While inaccurate timekeeping can lead to non-compliance to regulatory guidelines, installing a time and attendance system integrated with online attendance software can help Increase information accuracy and reliability. We must know that the negative aspects of inaccurate and unreliable timekeeping can lead to employees not being paid properly, noncompliance, decreased employee morale, and increased turnover. On the other side, the benefits of maintaining an accurate and reliable time and attendance information could go a long way in making workforce management much easier. Running a manual payroll at the end of the month can take up a lot of time and effort. The process involving the collection of time cards, reentry of data into the payroll solution, and time necessary to process payroll for the entire organization can be tedious and laborious. The same work can be drastically reduced to a matter of minutes with an automated time and attendance system. Moreover, automating the timekeeping through data collection devices can mean that time records are in an electronic format, which makes it ready to transfer the data automatically to the payroll solution for payroll processing. This in turn increases the data accuracy by automating the transfer of timekeeping information resulting in an increase in productivity and cost savings for the organization. There are chances of human error creeping in if employees are asked to log their work hours in manual timekeeping systems. The likelihood of inaccurate time tracking in a manual process can lead to a number of additional issues such as inaccurate wages being processed. Real-time collection of electronic data by employees’ punching in and out over a secure web browser, from an electronic or biometric time clock can also help eliminate data inaccuracies and voluntary time theft by employees. If the electronic systems allow supervisors to be alerted to early or late in/out punches as they happen, workforce attendance issues can be addressed early, before they become larger problems for the organizational profitability. Automated time attendance systems mean that employees are self assured about their payrolls and work-time calculation. It has been observed that a good company culture is a major contributor to attracting and retaining talent. A good relationship between the employer and employee translates to enthusiastic employees who contribute ideas, are optimistic about the company and its future, rarely absent from work, typically stay with the organization longer, and act as goodwill ambassadors of the organization. Though automating an organization’s time and attendance system means a significant investment, it can provide both direct and indirect investment returns. Cost savings, such as a reduction in human-generated payroll errors, elimination of time theft and overtime costs, the saved wages from increased productivity constitute the direct returns on this investment. The indirect cost savings can be allocating labor across your workforce with a better insight into your employees’ work, the time spent on their work, and the return on investment of their work. The increased process efficiency, data accuracy, and cost savings that result from an automated time and attendance system alone can help to efficiently share data from one department to other departments within the organization without manual re-entry of data and risk of the associated errors that can result. The potential risk of human error can be avoided by integrating all parts of your workforce management with automated software technology. The power that comes with the automation in time management systems in organizations is immense. Moreover, time and attendance systems also ensure the organization’s compliance with regulations about maintaining attendance records. So, a time and attendance system that integrates the HR and payroll systems can lead to a strong return on employee investment, which indirectly brings a positive effect on the overall profitability of the business. Effective ways to follow-up with prospects without nagging them. Start ups face an array of challenges during the initial few years of their establishment. While striking the magical break-even figures as soon as possible might be the aim for many, one of the biggest challenges for small businesses is to identify the fine line between effective following up on prospects and bothering them with pushy emails and calls. Despite the dilemma, it is very important for businesses in their formative years to reach out to new customers as much as possible, whether at meetings, business events or through email/social media. In any business, there is great importance on networking and building connections with prospects. Most Business Development associates are quick at sending product information whenever they receive queries. But, shocking as it may seem, it is found that they don’t do enough when it comes to following up with prospective clients. Usually, most small ventures prefer to sit back and wait for a reply after the initial query and response. Needless to say, a positive response seldom comes gift-wrapped knocking at your door. Most small business owners choose not to follow-up for the fear of appearing too pushy. While too many calls and follow up emails can indeed drive prospects away, the startling fact is that not many of small businesses ever come close to crossing the line of moral code of conduct. In fact, it is common observation that lack of follow-up efforts can be held accountable for losing business opportunities from prospective clients, and not the excess of it. One of the most common beliefs among small businesses says that opportunities in the form of prospective clients don’t come walking on their own. Customers may not take the pains to contact the sellers or service providers directly for a variety of reasons even if they are in need of solutions. Sometimes, a prospect may have queries about your offering which he might not directly come and ask. At other times, he may not understand how your product applies to his requirements, or he might be thinking of buying the product not right now but may be after two months. Follow ups come in handy on such occasions by providing the opportunity to educate your customers and let the prospects appreciate your efforts in helping to fulfill their business needs. What is required in such a scenario is a standard follow-up process that can strike a balance between being too pushy and not following up at all. The idea is to focus on the value addition in a particular relationship, in a way that a silent reminder is sent across at the same time. It is advisable for you to be responsive at the same time. It is advised to avoid appearing forceful irrespective of the medium of communication, be it on phone, email, a social media platform or in a face-to-face meeting. It should appear that you are out to build a lasting relationship with a client—at times by adding some supportive information, useful links, birthday cards, anniversary cards, notes of appreciation—rather than trying to sell your product across. If you share ideas, ask questions and try to understand their needs, it might leave a good impression on their minds regarding your business sense. On the other hand, if you call and focus on selling every time, by repeating the same message again and again, there are chances that your calls go unanswered and disrespected. 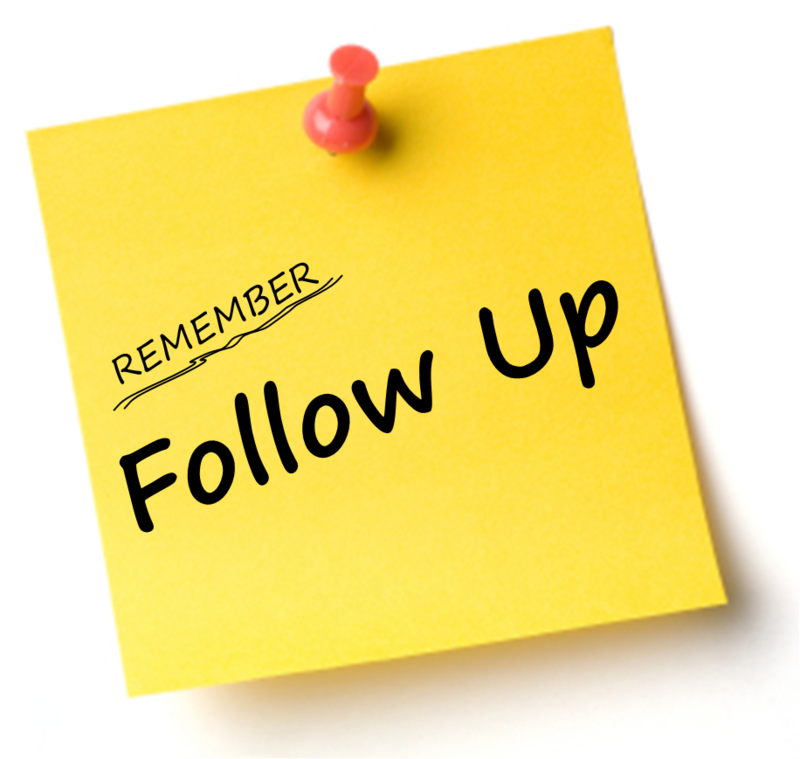 While most small business owners agree that follow-ups are a necessary part of business, they might find it challenging to accommodate them in their busy schedules. Many in the sales domain would agree that it even gets difficult to remember the names sometimes! Following a systematic approach by making a list of the important prospects, setting up reminders on calendars, deciding a follow-up plan, and recording the process can help you find your way out of the unyielding follow up dilemma. Save space, make your SMB paperless! Digitization of records is the new age method of data storage. Not only does going paperless clear clutter from your office environment, but it also helps your small and medium business (SMB) save money and project an eco-friendly image of your organization. In addition, paperwork is drastically cut down and the painstaking tasks of maintaining and stacking files are done away too. 1. Avoid printing documents: The first step towards moving to paperless office is to take fewer and fewer print-outs. Share files without taking print outs by transferring soft copies. Use utilities such as Google Docs integrated with Gmail for sharing your work simultaneously with colleagues on a document or spreadsheet. Some file-sharing tools and services even provide the option of collaborating with others through a chat, making file sharing that much easier. Plus, saving your data is much simpler with most of the word processing or publishing tools offering to auto-save your work. You can also download these files from anywhere into your inbox as long as you have an internet connection. 2. Digitize your existing files: Go through your files and prioritize the data which can be digitized and saved by scanning or manual data entry. For large number of files and voluminous paperwork, it could be very time consuming and you might require hiring an external data digitization agency to help in the process. You can have a Non-Disclosure Agreement (NDA) in place with your vendors to ensure the protection of confidential data. After your data has been digitized, organize it for easier access using a Document Management System. 3. Cloud storage is the better way: Cloud storage is proclaimed as the best and most effective way to back up your data. That way, it is made accessible from anywhere in the globe with internet availability and it is secure in the cloud as well with data encryption. Many cloud based service providers provide you with data security and back-up, and can help you in backing up your important company documents in a secure and organized way. 4. Paperless invoices, statements, and bills: Online bill payments save you from stationery and postage expenses, apart from the time spent in manual efforts. Running your office finances through web payments is faster and easier to track. With many banks and services offering paperless statements and bills, online mode of payment and maintaining an online account is simpler. For merchants, certain Apps accept payment through smartphone and you can email receipts to customers instead of printing them. 5. Collaborate to avoid duplication: Today, most of the work demands teamwork rather than individuals working like islands. There is huge stress on collaborative effort through brainstorming discussions, creating and sharing minutes of meetings, creating and getting drafts reviewed, and merging drafts and sections into a bigger single document. This could be done by using applications that allow screen sharing during presentations, transmitting videos, sharing files, teleconferencing and accessing whiteboards. Finally, it is advisable to store and access the master document places at a single accessible-to-all location. This will avoid having multiple copies being stored at all computer terminals and sharing them over email leading to overflowing inbox or outbox. Save your hard disk and email server space for better purpose. Technology provides a host of smart tools to help your office reduce paper waste. Every step towards a paperless environment will save you time, money, storage space and clutter. Such a step can be very useful for businesses especially small and medium businesses. Even though digitization of records may be time consuming initially but once the transition is complete, it will be a much appreciated step and will fetch the incentives and rewards in terms of long-term savings. Your company processes will become easier and faster, and it will be an important green step as well. Save paper, save trees. You can use Google Now to find the approximate location of your parked car. You’ll see parking location cards if driving is your main mode of transportation in Google Now. When the card shows up in Google Now, you’ll see an indicator showing the approximate location of your car. To see other locations where you’ve recently parked, touch Previous locations. Your location data for parking location cards isn’t shared with anyone else. If I didn’t park ,why do I see a parking location card? Google uses your device’s sensors to know when you leave a moving vehicle, which means you may see parking location cards even if you didn’t park your car. For example, these cards could show up after you exit a bus or a friend’s car. Choose when to see parking location cards. When a parking location card shows up in Google Now, touch the Menu icon on the card. Turn off parking location cards. Touch No when you’re asked if you want to keep receiving reminders about your parking location. If you don’t drive often, you can turn off parking location cards by changing your transportation setting in Google Now. To change this setting, open the main Google Now screen, then touch Customize > Everything else > How do you usually get around? Healthy Handling of Employee’s Attendance Issues. Attendance issues manifest themselves in every organization. How well you deal with them determines how healthy a work environment you can create for your organization. Attendance management can become complicated for HRs and managers especially in large organizations as tracking sick leaves, paid leaves, unauthorized leaves, over time, late comings can become a tedious affair. Additionally, employee absenteeism can have a big impact on your organization as whether the absence is planned, incidental or extended, it affects costs as well as productivity. 1. Have an attendance policy – Maintain in writing a set of attendance rules and HR policy for attendance. Convey to the new recruits at the time of joining your company’s attendance policy and make sure they understand them. You can convey the rules at orientation and can hand over the written policy in the employee handbook. Make sure the employee signs the policy to convey his acceptance and understanding of the same. 2. Share your opinion about attendance with your employees – Talk to your employees regarding your views on attendance. Set an example yourself by arriving a bit early, leaving a bit late, and avoiding sick–leaves. 3. Watch out for a trend – Watch out for employees who are often coming in late or reporting sick on Fridays or Mondays. It reflects their lack in effort to get ready in time or their desire to have a frequent extended weekend. This might become a trend with them if not checked. Begin with giving a gentle warning to the errant employee and watch out if they take heed. If they do not, then a stronger written warning is called for in writing or through an email or a personal meeting. 4. Address individual problem separately, collective problem in a team meeting – If you have one or two offenders for the same issue, you can hold brief one-on-one meetings with them. In individual problems, try to find out the reason behind chronic late coming or frequent sick leaves. Maybe the employee has a genuine problem to deal with which needs to be looked into separately. Try to reach the truth by asking for medical certificate for sick leaves or other evidence for any other given reason. If you face the problem with a bigger number of employees, it is good to have a team meeting with combined attendance goal for them. 5. Enforce the attendance rules uniformly – Make it clear that attendance rules apply to one and all. Do not use them selectively. Attendance rules should be uniformly applied to all without any favoritism or partiality. If the employees make out that there is favoritism or unequal application of rules, it may lead to chaos and indiscipline. 6. Make an allowance for personal business – To encourage honesty and upfront behavior, you can make an allowance for an employee’s personal work which can be done only during business hours. Again, this should largely depend upon the seriousness and gravity of the situation. However, make sure that this gesture is not taken advantage off. 7. Maintain accurate records – Use online attendance management software to keep accurate track of employee attendance and time. Online Attendance Software can also free up valuable time of human resources employees by weeding out the need to sort through time cards and calculate employees’ logged hours. Filing cabinets and numerous electronic spreadsheets can be avoided as attendance tracking software can store information about employee’s schedules, overtime and pay rates in same place and culling out data from it can just be a click away. In addition to traditional on premise attendance software, online attendance software allows you to share attendance information with other employees. Sharing attendance information with respective employees result in faster rectification of any errors or omissions and speed up payroll processing at month end.